The Charnley House, whether a collaborative design or not, served as a model for Wright’s earliest work as an independent architect, specifically the Willam Winslow House, built in 1894, which shares many similarities with Charnley. 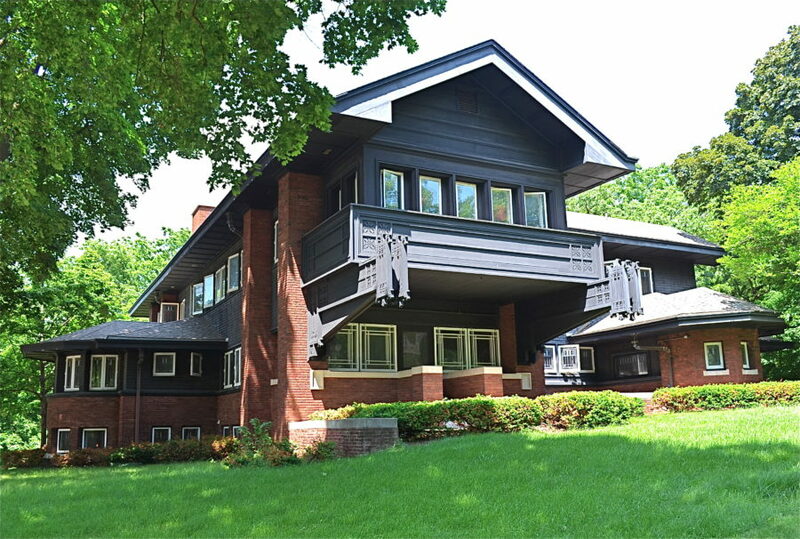 Besides Winslow, I will also discuss Sullivan’s later residential designs, specifically the Harold C. Bradley House in Madison, Wisconsin and the now-demolished Henry B. Babson House in suburban Riverside. Domestic architecture played a significant role in Adler & Sullivan’s practice in the 1880s. Although some historians dismiss Sullivan as a residential architect, these homes, designed near the end of his career, are just as interesting and important as any of his other commissions. As mentioned in Part 1, the architects had a falling out when Sullivan fired Wright in 1893 for breaking his contract (Wright once again bended the truth by claiming he quit), but eventually repaired their relationship. As they communicated by letter and met in person, there are strikingly similar parallels during the teens and twenties as both men had difficulty securing commissions and struggled financially. Two important modernist architects, Rudolph Schindler and Richard Neutra, knew Wright and Sullivan during this time period. Their recollections provide an intimate look into the lives of the mentor and apprentice as they experienced personal and financial struggles. In the series’ conclusion, I will discuss my own opinion related to the question of this series: Who designed the Charnley House? As someone who has spent close to a decade working inside the building, I probably know it better than most. The Charnley House is a perfect example of how architecture must be experienced firsthand. As I already mentioned in Part 2, the interior is a one-of-a-kind space; not only was the home ahead of its with time an open floor plan but its emphasis on the vertical with a 30-ft high atrium was also atypical. For such an unconventional interior, the home’s rooms were not recorded as no plans or period photographs are known to exist. Many wealthy families at that time were known to document their personal residences and furnishings so this is quite unusual, especially when you consider the fact Adler & Sullivan chose to publish the design in a number of popular architectural journals. The house, spread over four levels at 4500 square feet, only has eight rooms – a stair hall, sitting room/library, dining room, three en-suite bedrooms, and 2 servant rooms. This does not include service spaces like the basement kitchen, two pantries, storage rooms, and four full and two half bathrooms. Visitors to the home walk up three steps from the street; inside is a vestibule with a tile floor and vertical oak wood paneling that leads to an inner door. This space serves an important function, like most homes of the time period, as a way to separate the public from the private domain. It is worth noting the stained glass found here is most likely original as Frank Lloyd Wright’s George Blossom House on Chicago’s South Side, built the same year as Charnley, has the exact same windows. Although atypical of the glass designs most associated with Wright, historian Tim Samuelson believes the ornament of the art glass came from Wright’s own hand. Something as insignificant as a vestibule window might be proof that Wright didn’t design this house and was only in charge of minor interior details. Once you officially enter the domestic zone, your eye is immediately pulled upwards to the third floor skylight and the rooms on either side of the entrance hall. Instead of seeing a grand staircase, like in most well-to-do homes, there is a fireplace surrounded by a colorful and abstract mosaic of ovals, a design motif Sullivan used on not only the floors of the Schiller Building and Wainwright Tomb but also on the front door and balcony of the Charnley House. One can see every single tile in the mosaic with all the natural light shining down from the atrium. The wood carving in the newel post is a foreshadowing of further wood ornamentation seen throughout the home. One immediately notices this entrance hall is too narrow for any social activities; and even surveillance is limited by the hidden staircase and elongated wooden screen on the second level. Tucking away the stairs behind the fireplace, rather than it being a focal point, is another unorthodox aspect of the design. Homes from this period usually made a statement with a large, grand staircase. 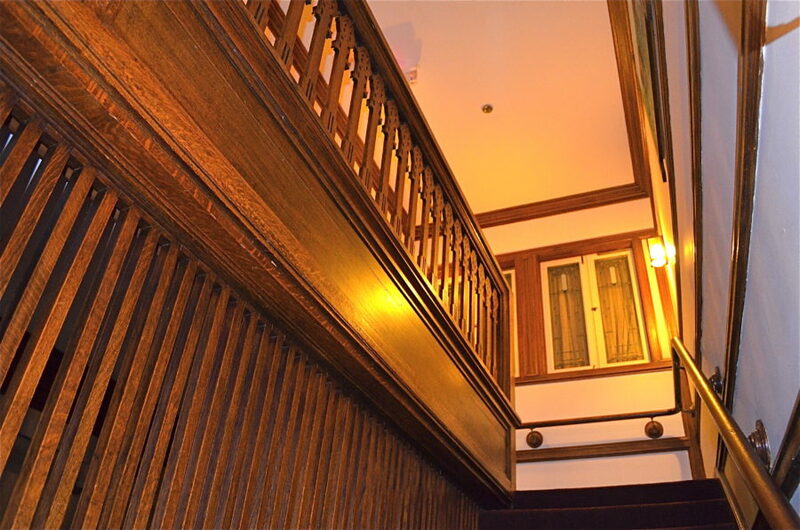 The three-story central space of the Charnley House is entirely unique for a domestic building, similar to the large enclosed light wells of late 19th century office buildings like Burnham & Root’s Rookery or even communal spaces like the Mecca Apartments, built at the same time as Charnley. The vertical atrium, later adapted by Wright in his Larkin Building (1903-06) and Unity Temple (1905-08), greatly contrasts the strong rectilinearity of the home’s facade. Charnley’s inside space is also elevated with three pairs of arches, while no doors separate the rooms. Although it was customary for a wealthy family to have at least three or four “social rooms” like a separate parlor/reception area, ballroom, and billiard room, the Charnleys did not follow the trends of the time. The fused function of the understated and simple parlor/sitting room/library into one space is symbolic of the family’s less public life. 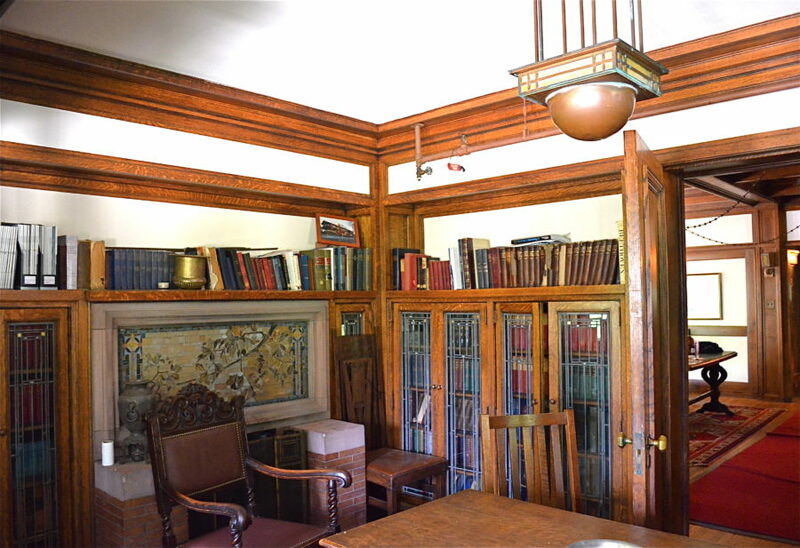 As mentioned earlier, one of their only known social activities was belonging to a local literary club, so the room’s walls are lined with built-in bookcases/seats and book shelves. Victorian homes usually were decorated with silk or patterned wallpaper but here the rooms are treated with just beige textured plaster and dramatic bands of wood, much like the cottage bungalows Sullivan designed the previous year. The severity of the plain interior must have been shocking to people in the 1890s; but the home was about fifty years ahead of its time in its simplification and emphasis on materials, a lot like a Miesian space. Instead of wood and plaster, just replace the room with glass and steel, and you can see the connection. The parlor/library and the dining room across the main hall both have custom-designed fireplaces. With the exception of the Harlan House from the same year, Wright did not design any ornament before 1894. However, on closer examination, the parlor fireplace panels lack the flowing and integrated character of Sullivan’s usual leafy patterns, which suggests Wright’s possible contribution to its design. Sullivan’s hand is more apparent in the dining room with its “seed germ” motif, which one can also see on the sawed-wood panels of the second floor railing and exterior balcony. It symbolizes the metamorphosis of a seed growing into a plant, much like the creative growth of designing and constructing a building. Although not showy like most parlors and dining rooms of the day, both rooms are given equal importance with similar dimensions, banded wood trim and restrained decor. Some historians believe Wright was the one who suggested concealing the stair behind a wall. But they are wrong as the idea was most likely “borrowed” from Sullivan’s main influence at the time, H.H. Richardson and his Glessner House design. Sullivan had already used it inside the Auditorium, with the main stair disappearing through an arch. Remember the Auditorium dates before Wright’s employment with the Adler & Sullivan firm. 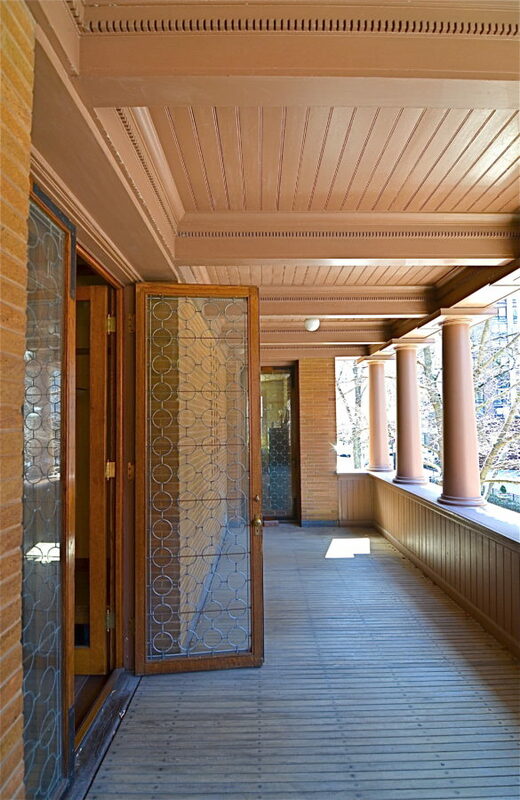 If Wright contributed anything to the design, it was probably the inclusion of each step and riser encased in molded pieces of wood with dentril trim underneath (mentioned in Part 2), as both Wright’s own home, the Harlan House, and his later independent commissions have trimmed staircases. If this is proof that Wright designed the stair, then what else is an obvious “Wrightian” feature? Well, one guess could be the second floor wood screen of 99 tapered spindles, which separates the staircase from the light well. 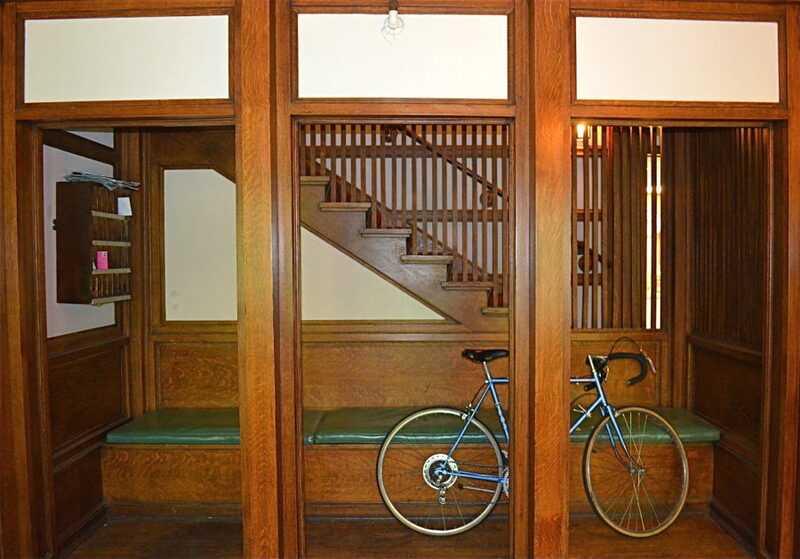 Wright, who first used it in the Roloson Row Houses of 1894, would continue to add this design feature to his later Prairie Style designs, most notably in the Frederick Robie House. The wood grill creates an interesting and contradictory visual by both concealing and outlining the stairs to the third level. Although not cantilevered, the stair has the effect of being unattached. When viewing the horizontal rise and fall of the stair treads through the vertical spindled screen, Sullivan has achieved the abstractness and spatial movement he created throughout his career. But Wright would also experiment spatially with contrasts in scale, room size, and ceiling heights as an independent architect. Who influenced who? Did Charnley serve as a source of inspiration for Wright or did Wright himself influence the concept of this vertical stair well? Upstairs each of the Charnleys’ four bedrooms, large for their time, had a fireplace, walk-in closet, and an attached en-suite bathroom. The southern bedroom on the second floor, assumed to be the master, has its own door to the balcony, the home’s only outdoor space. The double doors leading to this area feature a beautifully executed design of circles set in a square grid. Unlike many homes of the late 19th and early 20th centuries this was not used as a sleeping porch as this part of Chicago was too urban for such a private activity. Though a second-floor balcony was not unusual, especially in the Midwest, it served another purpose: it helped bring light and ventilation into the closets and hallway. It’s also surprising to not see attached sitting rooms into the bedrooms. The Charnleys were also unique as a wealthy couple in that they shared a bedroom as census records indicate their son, Helen’s brother, a family friend, and two Swedish servants occupied the other three bedrooms. It’s also worth noting the home, modern in design, was also ahead of its time in its utilities like central heating, electricity, and indoor plumbing. While still employed by Adler & Sullivan, Frank Lloyd Wright continued to create buildings either influenced by his first employer Joseph Lyman Silsbee or historical revival designs. It was not until he left Sullivan’s office in the spring of 1893 that Wright started to use Sullivan as a model of inspiration, evident in his first official independent commission, the William Winslow House in suburban River Forest, designed in March of 1894, nearly three years after the Charnley House. Winslow marked a transition for the young architect as he was memorializing where he came from and where he was heading simultaneously. William Winslow, a wealthy metal manufacturer who as Head of Winslow Ornamental Iron Works had produced designs for both Daniel Burnham and Louis Sullivan, had first met Wright during his days at the Adler and Sullivan office. Wright claimed the Winslow House was an Adler & Sullivan contract that he snared, which could be a possiblity as Winslow’s company created ornamentation for Louis Sullivan, most notably in the Carson Pirie Scott Store. Did Wright win the project by promising Winslow he could design him a “Sullivan house”? Not yet mature enough to completely depart from the historical revival and traditional styles of the “Bootleg Houses” the architect had created from 1887-1892 (which was briefly examined in Part 1), the Winslow design was Wright’s attempt to break away from the traps of conventionalism by paying homage to his mentor and “father of modernism,” Louis Sullivan, while also giving hints to his emerging Prairie Style of the next decade. Even Wright’s later assistant, Marion Mahony, in her book The Magic of America credited Sullivan as the main force behind Wright’s Prairie School style. As much as he tried to ignore his Lieber Meister after his firing in 1893, Wright appeared to be in no rush to rid his designs of Sullivan motifs. More or less copying the Charnley House, the then 27-year-old architect created characteristics in Winslow that would stay with him not just through his Prairie Style period but for the rest of his career – a foundation set firmly to the ground, a second floor that never completely dominates its lower level, and a generous hipped roof with overhanging eaves. The massive symmetrical facade is divided into thirds, again just like Charnley, with an outlined stone entrance, golden Roman brick and string course, and a Sullivanesque plaster frieze at the upper level. The technique of Winslow’s plaster ornament, very Sullivanesque, was to be used in other Wright Prairie buildings, most prominently in the Husser and Dana-Thomas Houses. The rather formal street facade is classical and balanced, while the home’s private side is surprisingly the opposite with its hodgepodge of geometric masses, as seen in the curved dining room, octagonal staircase tower, and large central chimney. Visitors entering the Winslow House will immediately see the similarities with Charnley, not just in the nearly identical front doors, but in the dramatic entry hall with its beautiful inglenook in the middle, rooms on either side, and a hidden staircase. Wright’s later Prairie Style homes were usually arranged around a dominant fireplace, and one can see that development here in the Winslow House. 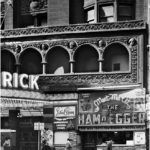 Yet Sullivan’s influence is still apparent in the utilization of the arcade with its leafy ornamentation with beading detail, which is strongly reminiscent of Adler and Sullivan’s work, specifically Chicago’s Schiller Building, constructed in 1891. 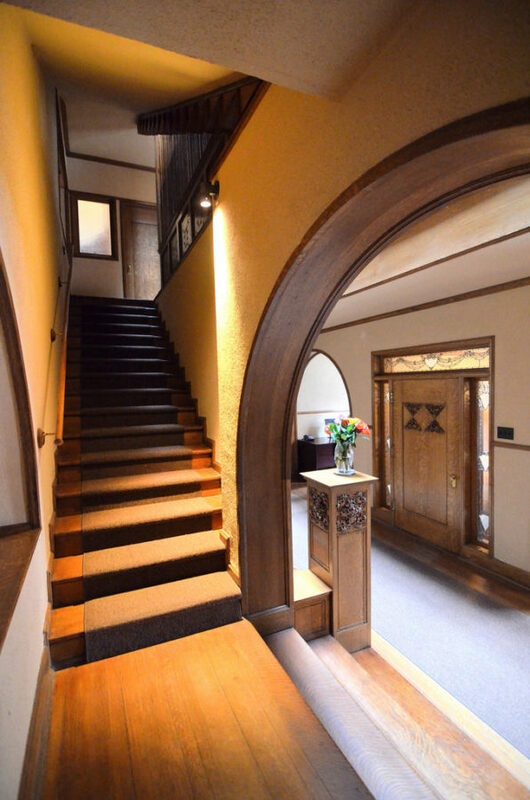 Geometric forms continue in the arched doorways, octagonal stair tower, and the curved dining room bay. These design fature serve as a counterpoint to the flat plane of the home’s front facade. If Wright solely designed Charnley, as some historians believe, then why did he wait nearly three years to revive its character, specifically the symmetry and geometric massing, in the Winslow House? Also why did it take Wright forty years to claim credit for Charnley? As a 65-year-old architect at a low point in his career, Wright attempted to mislead historians, like Mumford, to make them believe he had a dominant role in both designs instead of them finding out the truth, that he copied his Lieber Meister. Otherwise Wright’s Winslow House and his Prairie Style designs of the early 1900s no longer seem entirely original. Even after the dissolution of his partnership with Dankmar Adler in July of 1895 , Louis Sullivan continued to work on domestic commissions. 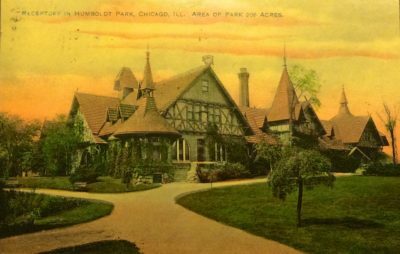 A number of these designs, including the Henry Babson House (1907-08) in Riverside, Illinois and the Harold C. Bradley House (1909) in Madison, Wisconsin, expand upon the design principles first established at the Charnley House. Some historians, like David Van Zanten, believe Sullivan’s 20th century homes, once dismissed, are just as important as Sullivan’s jewel box banks. He believes they expand upon the “spatial coordination of his theater model” in a more “horizontal” manner. While historians, like Narciso G. Menocal, theorize that “his houses…although they are excellent as works of art in the abstract, almost none of them functioned efficiently as family dwellings.” Why have Sullivan’s homes been so disregarded? Was he truly a failure as a residential architect as Menocal wants us to believe? A prosperous nationwide merchant of the popular Edison phonographic machines and other items, Henry Babson, commissioned Sullivan to design a 28-acre estate in suburban Riverside. Supposedly Babson had overheard a group of architects complaining about their lack of work due to the bad economic times. They said it was so bad that even “the master” could not find work; when Babson asked them who that was, he ended up hiring Sullivan. Around the same time, his brothers Frederick and Gustavus also hired Prairie School architects Tallmadge & Watson to create their own homes. Sullivan presented Babson with three conceptual plans; he chose a rectangular two-story structure with an attached service wing. Due to the home’s expansive property, Sullivan designed a number of terraces and porches to interact with the outdoors, which included three large elm trees located on the property. On the northwest side a large gallery with a wide window overlooked the open prairie. Besides its formality and geometric boldness, the Babson design also resembled Charnley in having a similar floor plan as the first story included a large entrance hall, living room, inglenook, and dining room. Photographs from The Brickbuilder, an American magazine on architecture and building, from 1910. The exterior of Sullivan’s Babson House resembles a characteristic Prairie Style design with its dominant horizontal lines, broad eaves and low-pitched roof. The cantilevered arcaded loggia on the second level and the fretwork on the spandrel panels not only resembles Charnley but other Sullivan buildings as well. Unfortunately the residence was demolished in 1960 to build a new subdivision. After removing ornament and disassembling the balcony, photographer and historic preservationist Richard Nickel recalled returning to the Babson House two weeks later to find it completely flattened. The Bradley House, Sullivan’s only commission of 1909, was a gift for industrialist Richard Crane’s daughter Josephine and her husband, Harold, a professor at the nearby University of Wisconsin. Writing in 1965, the 87-year-old Harold Bradley recalled that Crane was an “old friend of Louis Sullivan, [who] was having a hard time just then, and he would like to assign Sullivan the job.” Located on a hilltop in Madison’s University Heights, the T-shaped home’s most striking visual is that the bedrooms cantilever over the floor below. Architectural historians, like David Gebhard, later argued that George Elmslie (mentioned in Part 2) deserved credit for this particular home, even though both Elmslie and the client believed it truly belonged to Sullivan. 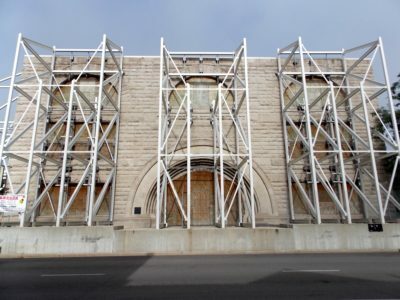 According to Bradley, Sullivan’s role diminished as the work progressed, mainly due to Sullivan’s alcoholism in which he was “not drunk, but somewhat tipsy, sometimes vague or sleepy” but he was always involved in its design. Refusing to change the home’s size to meet the clients’ demands, Sullivan eventually left the project in December of 1909 and it was completed by Wisconsin architects Claude and Starck in 1913. Yet Bradley emphatically stated that his house was always a Sullivan design. Acting as Sullivan’s “skilled project assistant,” Elmslie had left Sullivan’s office in the Fall of 1909, but later worked with Bradley on furniture design and interior detail. When the Babson and Bradley Houses were built, Wright had only harsh words, calling the designs “backwash” of his own work. In Architecture As Nature, historian Narciso G. Menocal writes that “Sullivan, who was a bachelor with no family, imposed his ‘idiosyncratic’ designs upon his clients.” Bradley failed as a family dwelling, but has “worked splendidly” as a communal space for the majority of its existence (one-hundred years to be exact) as the home of the Sigma Phi Fraternity. According to Menocal, Sullivan was unable to express “domesticity” in room size, scale, or relationship of functions; his homes are too formal and impersonal. If Sullivan was a failure as a residential architect, then who says Wright wasn’t as well? Charnley is not any more domestic than Sullivan’s later residential commissions simply because of Wright’s role. I have spent over a decade working inside Charnley as well as a number of Wright homes. Although beautiful, these buildings are completely impractical as single-family-homes, whether they are the work of Sullivan or Wright. And who says Sullivan failed? Just because the original clients, like the Bradleys, did not like it? Who says another family couldn’t have moved in and loved it? Sullivan designed nearly sixty residences in the 1880s and 90s. He obviously knew what he was doing. Rather than being impractical and awkward designs as Menocal argues, historian David Van Zanten believes Sullivan’s “domestic environments…are intensely formal and public, but to him that is precisely what both design and life were.” If these homes are impersonal and grand and unlivable, then that was Sullivan’s intention. As in the Charnley design, both Babson and Bradley’s dramatic entrances are “the heart and key of the composition.” As mentioned in Part 1, Sullivan’s Beaux-Arts training never left him. According to Van Zanten, “the entrance-study cross-volume that increasingly appears in Sullivan’s layouts is a consistent elaboration of a processional construction in Sullivan’s interiors that makes them the opposite of Wright’s schemes.” Like his flowing ornamentation, Sullivan’s goal was movement through a geometric mass. The Babson and Bradley Houses are a continuation of the theme that began over a decade earlier in the design for Charnley. Louis Sullivan and Frank Lloyd Wright were “so psychologically intertwined that an eventual reunion was inevitable.” The teens and twenties were difficult times for both men: Sullivan’s career dwindled while Wright’s personal life was in shambles. After abandoning his wife and six children in 1909, Wright became a social pariah. He experienced the devastation of losing both his beloved home in Wisconsin and mistress, Mamah Borthwick Cheney, in 1914. Wright was finally granted a divorce in 1922 only to see his home burn down a second time, find himself arrested and detained for violating the Mann Act, and have his career dry up. 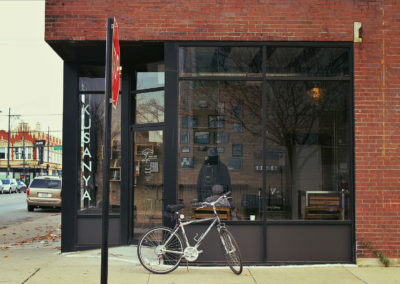 Meanwhile, Sullivan’s arrogance and deep commitment to his architectural convictions caused the decline of his practice, eventually leading him to a life of poverty. His assistant George Elmslie recalled that Sullivan lost many jobs because he would not compromise or do what was necessary to please clients. Alcoholism might have been another reason why Sullivan’s career diminished after his break-up with Dankmar Adler. Although extremely close to his brother Albert, they quarreled in 1896 never to speak again. Historian William Connely believes this is when Sullivan’s drinking spiraled out-of-control, which would last for the next twenty-five years until Sullivan completely gave up liquor in 1920. After Wright was fired by Sullivan in June of 1893, he did not see his mentor again until 1900 when the Architectural League of American Convention paid the tribute to Sullivan. Their official reconciliation took another decade, sometime after the devastating fire at Taliesin, Wright’s home in Wisconsin, in 1914. The architect and his mentor “came together again” first communicating by letter then meeting in person during Wright’s visits to Chicago, which he would frequently visit. He even moved into a little brick Georgian-style cottage, originally built in 1891, in the Gold Coast with plans to build his own design in the same neighborhood. After working on Midway Gardens Wright may have been hoping for more building opportunities as the architect only saw seven of his commissions reach completion between 1911-1914, which only got worse in the next decade. After the dissolution of his partnership with Dankmar Adler, Sullivan soon fell into obscurity. The metropolis of Chicago rejected him, and Sullivan had to look elsewhere for commissions, mainly in prairie towns in the middle of nowhere. His “jewel boxes” in places like Owatonna, Minnesota and Algona, Iowa were beautiful and one-of-a-kind buildings, but such projects were rare. By 1905, Sullivan was living in a seedy apartment in the Lessing Annex Building (now the Commodore Apartments) at Broadway and Surf. Although his Ocean Springs cottage, mentioned in Part 2, gave Sullivan a sense of identity, the financial crisis of 1907 forced him into bankruptcy and, over the next few years, Sullivan was forced to sell his cottage as well as all his architectural library, art, and household goods. In 1909, the same year George Elmslie finally left his employment, Sullivan moved from the Auditorium Tower, where he had worked since the building originally opened in 1889, to cheaper rooms down below. Commissions had dried up. During this time three out of five residential projects were completely rejected by their clients. Between 1910 and his death in 1924, Sullivan lived in a $9-a-week room in the Warner Hotel. William Presto, an associate who worked with Sullivan on his final commission, the Krause Music Store, recalled that Sullivan “was not above asking for a modest 50 cents, perhaps for car fare…[or] a bit of lunch.” With no important commissions, Sullivan sought refuge at the Cliff Dwellers Club, then at the top of Orchestra Hall on Michigan Avenue, where he was allowed to use a writing desk for free. He worked on his architectural theories, which were later collected in the book Kindergarten Chats. Deeply in debt, Sullivan spent his final years in obscurity living off hand-outs from his disciples like Wright and others. He died April 14, 1924 in a seedy Chicago hotel with only $189 in his bank account. His devoted friends again helped out, paying for his funeral expenses and eventually erecting a monument in Graceland Cemetery to replace a simple headstone. Thomas Tallmadge, who coined the term “Chicago School,” led a committee to finance the memorial, which had Sullivan’s profile set in one of his own ornamental designs and a personal tribute. In the examination of the final days of Frank Lloyd Wright and Louis Sullivan’s relationship, it is worth noting that two future modernist architects, Richard Neutra and Rudolph Schindler, were both part of their lives during this time period. Modernist architect Richard Neutra left Europe for the New World in October 1923, first arriving in New York City before making his way to Chicago to see firsthand the Wright and Sullivan buildings that so inspired him. Appalled and fascinated by the crime-infested, smelly city, Neutra described Chicago as “a fat, dirty, healthy child with great potential.” Having personally observed the abstract work of Adolf Loos, Erich Mendelsohn, and Mies van der Rohe back in Europe, Neutra’s pilgrimage to see Wright’s Prairie Houses left him disillusioned as he found them “retardataire” and “dated” yet he still desired to meet Wright in person. During Sullivan’s funeral at Graceland Cemetery in April of 1924, Neutra finally met Wright who he thought “looked ill at ease in front of a lot of hometown adversaries.” When Neutra acquired if he could help Wright with his commissions, Wright replied, sounding a lot like his mentor Sullivan, that “I don’t have any work, you know. A modern architect can’t have any work to speak of in this country.” This statement was not an exaggeration as Wright only managed to get two projects built between 1924 and 1933. Neutra worked briefly for Wright at Taliesin before accepting an invitation from his close friend, Rudolf Schindler, to work and live communally in Schindler’s Kings Road House in California. Schindler had arrived in Chicago a decade before Neutra in 1914. He had left his native Austria with the intention to work for Frank Lloyd Wright. Although he met the famed architect that year, Schindler had to wait until 1918 before he was officially hired. In the meantime, Schindler, then living at Wright’s Oak Park Home & Studio, invited Sullivan for a personal visit. Sullivan’s letter accepting the invitation was found amongst Schindler’s possessions when he died in 1953. Schindler continued Wright’s American operations while Wright worked in Japan on the Imperial Hotel. He later followed Wright to Los Angeles to work on commissions like Wright’s California block houses, but he found the architect to be “devoid of consideration and has a blind spot for regarding the qualities of other people.” Schindler felt underpaid and exploited as Wright’s employee. Their relationship completely broke down by 1931 and they never reconciled, echoing Wright’s earlier fracture with his assistant Marion Mahony Griffin and her husband Walter two decades earlier. Although the debate over the Charnley House’s authorship will continue as long as there are architects and architectural historians, I hope this series has added a refreshing angle to the dialogue. We’ll never know who designed Charnley. But the mythologizing of Wright needs to stop. It’s been going on for decades and decades. Architectural historian Grant Carpenter Manson wrote in his 1958 book “Frank Lloyd Wright to 1910: The First Golden Age” that Wright and Sullivan were “of equal stature” and that “any influence flow(ed) more in Sullivan’s direction than in Wright’s.” In 1960 historian Vincent Scully declared that “Wright, at 22, was already more abstract than his predecessor.” Really? Have Scully and I looked at the same buildings? Because I strongly disagree. Then you have Hugh Morrison, who contradicts himself in the monograph Louis Sullivan: Prophet of Modern Architecture, from one sentence to the next – “Students familiar with Wright’s developed ‘prairie style’ of the early 1900s find it hard to believe that this [Charnley] is one of his designs, since it has so many qualities of formal symmetry, monumentality, and sheer height that are completely lacking in his later work, together with undeniable Sullivanesque features. But a comparison (of this house with others) leaves little doubt that the Charnley residence may be considered a very early work of Frank Lloyd Wright.” Published a few years after Wright’s autobiography, Morrison validated Wright’s claims of Charnley authorship, which would go unquestioned for the next fifty years. I find it preposterous that some historians call the design a “collaboration” as that word suggests Sullivan and Wright were peers or equals at the time, which is simply untrue. (My apologies to Mr. Manson.) In 1890 Sullivan was at the peak of his career as partner in one of Chicago’s leading architectural firms; Wright was a 23-year-old employee, initially hired as a renderer and a decade away from full maturity as an architect. Beginning with the Ryerson Tomb, which was designed before Wright joined the firm, Sullivan grew as an architect during his experimental period between 1887-1890. The Charnley House fits perfectly with the evolution of Sullivan’s personal and modernist style. There was nothing in Wright’s work at this time, as I mentioned in Part 1, to suggest he was capable of creating a building of such geometric clarity and total abstraction like Charnley. It was only after Charnley’s completion that Wright’s work began to resemble the characteristics of the home’s design, as I discussed earlier with the Winslow House. Let’s not forget Wright had little publicity prior to 1910. Chicago’s major architectural journal between 1883-1908, the Inland Architect, was silent on the subject of Wright while Sullivan was considered to be the major influence of the new style, later to be called the Prairie School. If Wright did not design the Charnley House, then why did he make these claims? Throughout his nearly seventy-year career, Wright was a constant showman. If he excelled at anything, it was endless self-promotion, helping to create the legend of Frank Lloyd Wright that still exists to this day. Even though Wright died in 1959, his name lives on. People who do not know a single thing about architecture know Wright’s name, while Sullivan is nearly forgotten by the general public. But there was another motive behind selling himself. While a painter can go out and buy a canvas to create a piece of art or a musician can pick up an instrument to create a song, an architect needs a client in order to produce a physical building. Wright needed commissions, especially during the bleak part of his career in the 1920s and 30s. In An Autobiography he is making himself out to be greater than he actually was at the time he worked for Sullivan because he had to. Let’s not forget Wright was an egocentric who had a tendency to embellish the truth. Wright would claim credit for not only the Auditorium but also the Wainwright Building, Chicago Stock Exchange, and the Schlesigner and Mayer Store. Why do we question his involvement with those buildings, but not when it comes to Charnley? Unfortunately Wright’s self-importance came at the expense of not only assistants like Mahony and Schindler but his own “Lieber Meister” Louis Sullivan. Would Wright have ended up being a great architect no matter what architect he trained under? Maybe, but he would have been a very different architect. Wright’s style of ornamentation was entirely shaped by Sullivan, who was trying to invent a completely new order of design for American architecture that did not follow traditional styles. Sullivan’s organic motifs were completely rooted in the natural world, a notion that Wright carried all the way to the end of his life. Wright was not exhibiting anything that was really “new”, especially organic architecture, until he started working for Sullivan. The same can be said for Mies van der Rohe, probably one of the world’s most famous modern architects. How would Mies’ design motifs have developed if he had not had the opportunity to work for Peter Behrens early in his career. Until that time, Mies was working in traditional styles. The entire modernist movement owes its development to Behrens as it wasn’t just Mies who worked for him, but Gropius and Le Corbusier as well. In a parallel with Sullivan, Behrens does not get the recognition that he deserves. It’s interesting to consider what would’ve happened to Wright’s legacy if he died when his career was taking a nosedive in the 1910s and 20s, long before the establishment of his Taliesin Fellowship, the writing of his autobiography, and the production of some of his most famous works, like Fallingwater and the Guggenheim Museum. Would we still be talking about him? Would his name still be associated with Charnley? Although the argument can be made that 1891 was the busiest time of Sullivan’s career as he had four major commercial buildings underway (plus three on board as well as the work for the World’s Columbian Exposition), whatever role Wright might have played, Sullivan’s contribution to the Charnley House should not be dismissed. 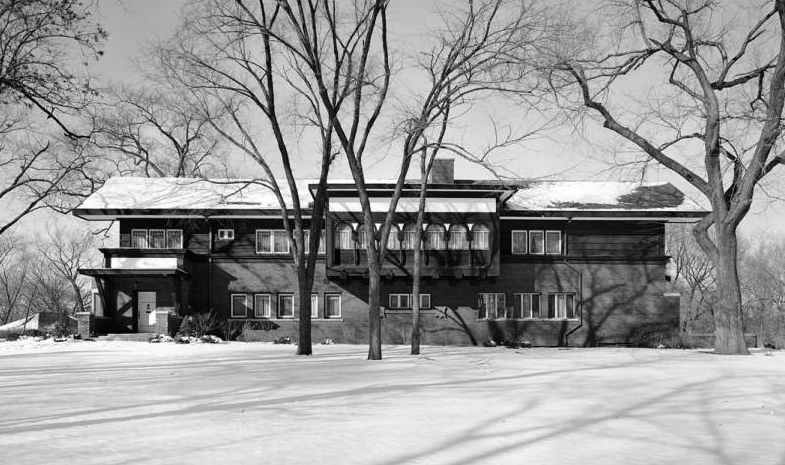 As Wright biographer Brendan Gill dutifully noted in Many Masks, the relentless rigidity of the facade and its interior “bears Sullivan’s stamp.” The total emphasis on modern abstract forms and simplicity was part of Sullivan’s design process at the time, whereas Wright was still designing homes in historical revival styles. Sullivan’s close relationship with the Charnleys also cannot be dismissed. Besides the fact that Wright, who made misleading and self-serving statements during his entire career, only became attached to the home after Sullivan’s death. Wright might have been “a good pencil in [Sullivan’s] hand” but so were Irving Gill and George Elmslie. There would no pencil, or Wright for that matter, without Sullivan’s influence. Connely, William. Louis Sullivan as He Lived: The Shaping of American Architecture, a Biography. New York, Horizon Press, 1960. Neutra, Richard. Life and Shape. New York: Appleton-Century-Crofts, 1962. Severens, Kenneth W. Prairie School Review Volume XII, No. 3, June 1975. Twomby, Robert. Frank Lloyd Wright: His Life and His Architecture. New Jersey: John Wiley & Sons, 1987. This series has been absolutely fantastic, thank you. Rachel, your work is amazing! thank you for actually trying to interpret the physical evidence, which not many people do – but really,the art glass at the Blossom and Charnley house from a catalogue?? no – and most importantly, you overlooked how projects are accomplished in a large arch. firm. There is a partner, and project architect, just like sullivan and wright. They designed the house like any other project in the firm – not very complicated. You might try talking to people who actually worked on the house – sometimes they have insights! Thanks for reading and commenting, John! First of all, I work at Charnley-Persky as tour manager, and have done so for almost a decade. I’ve learned a lot about the home over the years. In regards to the Blossom connection, I was told by Pauline and Anne about it and the possibility it could have come from a catalogue as its design was not something Wright or Sullivan would have done. If that’s wrong, I’m sorry but that what I had been told. I don’t know if you read Part 1 or Part 2 of this series but I do go into the roles of a big architecture firm. I specifically discuss the possibility of both Irving Gill and George Elmslie and the roles they might have played in the firm. Comparing other projects Wright was attached to at the time, and their lack of “modernist” touches has led me to believe Charnley did not solely come from him as he claimed. But lastly, the series was meant to lay out all the intrigue and controversy associated with the home’s design. Of course we’ll never know the absolute truth as I know a lot of original documents related to the home do not survive. But the fact that Wright only claimed he designed Charnley after Sullivan was dead and almost 40 years after the house was built is an important consideration when discussing who did what. Was Wright at his full strengths when Charnley was designed? I think not. He was only 23 years old. Did Sullivan strongly believe in the “initial sketch” of a design and was known for being very hands-on? Absolutely. I think it’s about time Sullivan deserves some credit and recognition. He’s been overshadowed for too long by his mentee. of course sullivan should be credited! You should probably talk to Tim Samuelson about the ornament on the art glass. He will show you other examples. Don’t forget Elmslie’s comments about Wright _ “I remember the morning that Frank brought in the 1/4 scales” referencing FLW working on the house in the evenings. I’m sure the massing, etc. was Sullivan’s, even some of the interior ornament, but I’m also sure he left it up to his employee FLW to complete the working drawings. It’s interesting that Tim thinks the windows might be designed by Wright or Sullivan, although I have disagreed with him on a few things, like the possibility of Irving Gill’s role in Charnley’s design. Thanks again for the comments! I will add/change the part about the Blossom windows as soon as possible.